In October of 1994, three podcasters disappeared in the woods near Burkittsville, Maryland. Police were baffled by the podcasters’ vanishing… mostly because podcasting had not been invented yet. A year later the MiniDisc player they recorded to was discovered. 21 more years later, that recording is released here. 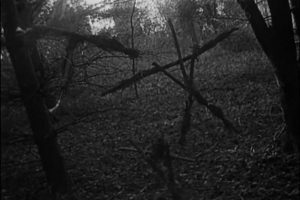 Just in time for Halloween (and yet another sequel), WHEN WE WERE YOUNG’s second episode tackles 1999’s unlikely horror hit THE BLAIR WITCH PROJECT. Is the ultra-low-budget thriller still as groundbreaking as it was in the pre-smartphone era, or does it deserve to be banished to the woods? Kick your map in the creek, apologize to everyone’s moms, and follow us on this audible journey… because Becky totally knows where we’re going! Right, Becky? …Becky? When We Were Young is a new podcast devoted to the most beloved pop culture of our formative years (roughly 1980-2000). Join us for a look back to the past with a critical eye on how these movies, songs, shows, and more hold up now.